Ducks—mallards, often—are like the pedestrians we saw in Istanbul. With a sort of arrogant carelessness, they (Turkish pedestrians) stepped right into the traffic and walked purposefully across the street without pausing, a sneer on the face, as if daring the buses, cars, trucks to hit them. The pedestrian was unscathed and we ordinary folk stayed back waiting for the light that didn’t seem to change. Well, ultimately it did, but it took a long time and most people simply ignored the light. In the same manner, big ducks lead their ducklings across Lewis Avenue to a park while the cars waited for them. A block away, to my horror, the mangled remains of a duck stuck to the asphalt. I wondered: angry 75-year-old man in huge car? Querulous and daft 90-year-old woman in old car? Teenager in pickup in a hurry? Mean person? The duck was almost unrecognizable, but for the feathers, the arrogant sneer on its beak. I enjoyed my daily commute to Lame Deer from Billings, exactly 106 miles, except when I drove on winter snow tires that were slightly greater in circumference. Then, 105, by my odometer. In June the hills of Eastern Montana had green velvet, the skies huge billowy cumulonimbus. 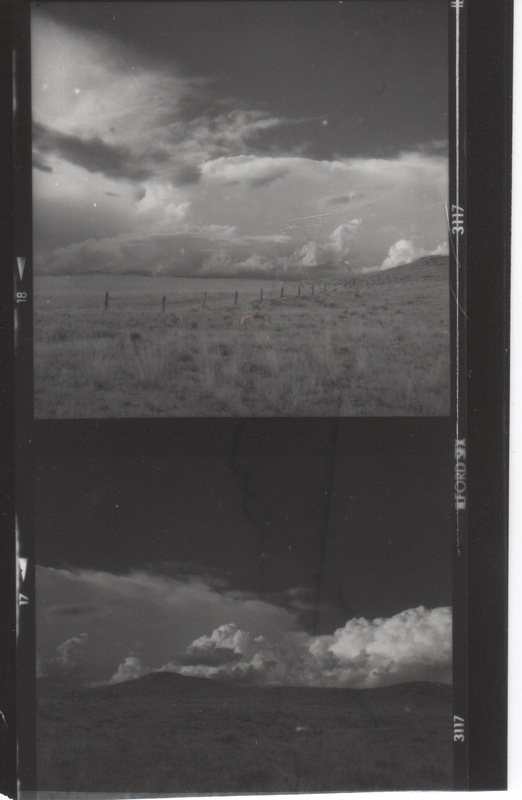 One year in the 1990s I had camera with infrared film and a dark red filter, so I occasionally stopped. Perhaps I can go downstairs to my darkroom and dig out such a photograph. I made so many photographs that I thought were noteworthy that I got tired of making them. The best cameras are no better than my own eyes, I thought. The best admirer can be no better than a brain that sees it. I hate generalizations, but I broke my roll of film a week habit! “dev” “stop” “fix.” At some point I got the lids mixed up and ruined the chemicals. But not before I developed some amazing prints, using the old negatives my mother gave me, ones she saved from her brother Carl R. Bonde, Jr. He was killed in WWII and was the darling of her childhood home, being the only boy among three older sisters. The point was, I don’t mind rabbits, I even like them, I even feel happy if they don’t hop away. Often they hop across the street and I fear they will be hit by a car because they cross fearlessly, like ducks, kittens, and Turkish pedestrians.